This 4.2 x 7.2m Salthouse Studio is going to be used as the focal point of a large entertainment area this customer is currently creating at the bottom of their garden in Hemel Hempstead, Hertfordshire for family and friends to congregate in when they have parties through the year. 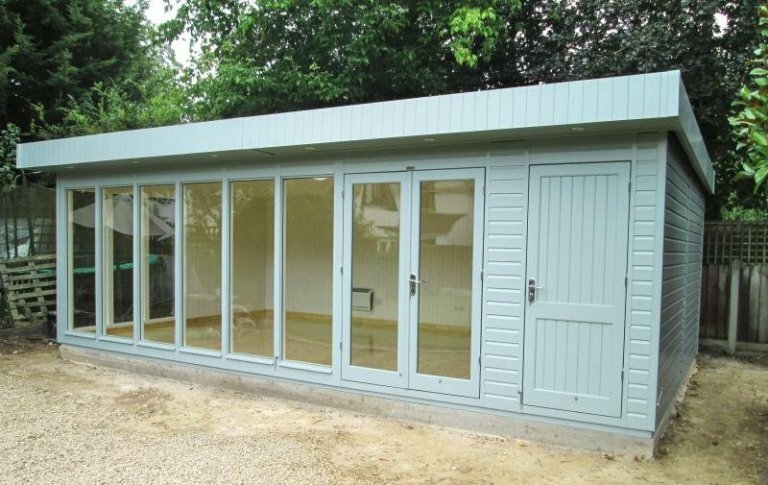 The storage partition is to keep extra bits of garden furniture and toys for the children inside: it isn’t a very large area, as it is 3.0 x 1.2m altogether, not extending all the way to the back of the studio. This has created a little corner alcove in the back right corner of the studio, giving them a bit more space to use in the insulated, Studio area (the storage area isn’t lined or insulated). The Salthouse, and any of our Garden Studios, are perfect for using all year-round, as they come (as standard) with full insulation, matchboard lining, draught excluders in the doors and windows, and all the windows are double glazed. This customer also opted for guttering, an electrical pack with two heaters, a Natural lacquer on the floor, and they also asked us, specially, if we could paint the ceiling in Ivory to match the matchboarded walls. We would like to thank you for the installation of our Salthouse Studio on Friday. The installation team were first class and most professional. 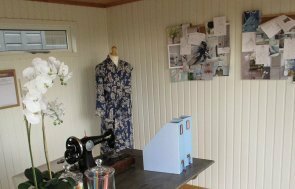 My wife is now fitting it out as her sewing room.The quality of the building is second to none, the amount of light from the full height windows is better than expected and ideal for crafts.Thank you again for the first class building and a first class service. Heavy duty felt has been used on the pent roof, which is heat-bonded on to extend its lifespan, and the customer asked to have canopy lights fitted to the underside of the roof overhang on the front side to light up in the surrounding area at night. 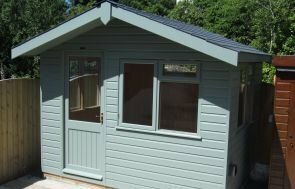 To finish off the studio, the customer opted for the colour Verdigris from our Valtti paint range, to give a multi-layered, opaque coverage of paint in a natural colour that has a long re-decoration cycle. For more information on lovely buildings, please call us on 01760 444229 or send us an online enquiry to ask our helpful team any questions you have.